Death penalty-what do the tweets say? Born in Athens, Greece but with origins from Prosilio, a small village at South Peloponnese. Obtained a degree on Educational Science on February 2012 from the National and Kapodistrian University of Athens. Having been working as a private teacher for the last 2 years and as a promoter part-timely while learning latin dances and playing volleyball. The realization that new generation of teachers has evolved from being consumers of digital environments to analysts and designers of such environments, and the impact that new media have on people and relations led me to this specific master New Media and Digital Culture. And though I have difficulties in finding a house I am still very excited to be here for this purpose. As a rational creature, man has invented many ways to exterminate his fellowmen; gallows, stoning, crucifixion, electric chair, burning at the stake, guillotine, firing squad, gas chamber, injection with poison are only some of them. Throughout the course of chronicles, history has proven that there is always a reason for humans to eradicate the violator of the law, the enemy and the infidel. 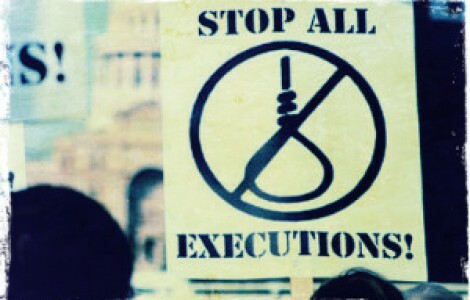 Hence, death penalty is still being used in the year 2012, justifying once more the most primitive instincts of humanity. The 10th of October 2012 was the World Day Against the Death Penalty, which was celebrated for the first time in 2003 and launched by the World Coalition Against the Death Penalty. Despite the fact that there have been significant steps to eliminate this phenomenon, there are still countries that maintain this way of punishment. According to the International Amnesty, 18.750 people are now on a death row while 680 were executed worldwide in 2011, without China being included in these numbers. Though in Middle East, death penalty could be partially justified by society’s conservative mentality, there seems to be no excuse for USA, which is the only country in G8 carrying out capital punishment! The same is for Belarus, which is the only country in Europe still practicing this punitive method. These facts raise many questions indeed. Why are there still countries supporting death penalty? Are there any cases that rationalize this attitude? Who can blame those who find this measure, an appropriate way of punishing the child molesters? In the same time, what can USA learn from the Norway’s A. Breivik trial and the silent attitude of the victims’ families? Who can bring back the lives of those executed and proven to be innocent after their death? Finally, what’s the public opinion? Do people agree or not? In order to find out what people think of capital punishment, I used Issue Crawler to explore some 200 tweets of the same day. To my surprise many are those who are in favor of death penalty. Some of them consider capital punishment appropriate under specific circumstances such as child abuse and murder. Many tweets were dedicated to the recent case of Ex-Raider Anthony Wayne Smith and the possibility of being sentenced to death penalty. Another tweet that appeared with great frequency had to do with a recent post of the Wall Street Journal about the death penalty debate and the raise of a new argument against it, that of a cost-focused point of view. Jimmy Savile also appeared often throughout the twit list. Seems like the users consider death penalty ideal for his case of child abuse, also. Amanda Todd, the girl who committed suicide due to cyber-bullying through Facebook, came up quite often, with people supporting that those who pushed her to death should also be dead. Charlie’s Fuqua book “God’s Law: The Only Political Solution”, where he seems to endorse death penalty for rebellious children as a way of proving that their parents have authority, seems to raise many reactions against him in the world of twitter. Many are the users declaring that they still don’t know if they are against or pro death sentence. So what’s going on here? World Day Against the Death Penalty but still people believe in its effectiveness? It seems like the issue of capital punishment raises more questions than answers. Seemingly, we are against capital punishment while in fact we support it. What’s the reason for still supporting this eye-for-an-eye mentality? Maybe the answer lies in the well-functioning or not of the correctional system. Or just killing people who kill people is the best way to prove that killing is wrong? Do citizens feel satisfied with the decisions taken for the punishment of the most dangerous criminals? And what about the moral issues? What’s the difference between the executor and the killer? How can the judges invoke the violation of human rights while they announce the death sentence of the defendant? Does the severity of a crime justify death penalty? How can we say then that we live in a democratic society? Scene from the movie ‘Green Mile’ were the main character, John Coffey, while being on a death row is proven to be innocent. Apparently though the countries using capital punishment have decreased since 1977, it still remains one of the most controversial issues. The tweets gave me the impressions that this dimension of views can be interpreted to some extent. On the one side, public audience considers it as the only way to ease the pain of the victim’s family and a way to prevent criminal action. On the other side, scientists and governments examine its effectiveness as a way of intimidation. But are we sure that a killer is that mentally balanced so that to be afraid of being killed?